A collaboration born of a friendship begun in San Francisco's North Beach and conceived as a book, of text by Rene Fontaine and photographs by Dennis Letbetter. The writer and photographer, questioning the mimetic approach in book illustration, established the rule of working independently of one another, with objects owned by Rene Fontaine. The result is a dialogue of discovery between a text of stories and their reflections, both perspicuous and distinct, counterpointing beautifully with the constructed-image photographs, sometimes direct, sometimes with an aspect of the surreal. The publication of this exquisite book marks an important step in the best tradition of the illustrated book. 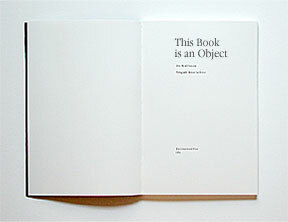 The subject of this book is the Object. Objects are, in general, the agreeable hooks that hold for us some miscellaneous remembrances of the past. Our objects are the 'fun' feeder of our memories. Each one has its profound story, with its secondary sequences, and its imaginative potential. From each of them hang the rich and honeyed fruits that nourish our auxiliary but essential thoughts that make us one, indivisible and absolutely unique. They contract (from the word 'Contraction') in our eternal present, each time we acknowledge them, our very personal past history. This edition is limited to one hundred and fifteen signed and numbered copies printed in Rives BFK by Jack W. Stauffacher of the Greenwood Press. 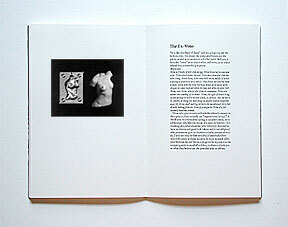 The text is set in Monotype Van Dijk and the display handset in Meridien, 50 pages, format 8 x 12 inches (20.4 x 30.5 cm). Printed on the Geitz Platen Press. 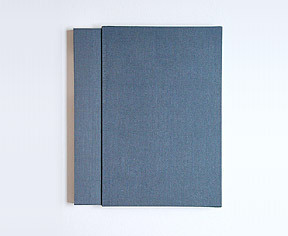 One hundred copies bound in blue paper covers with slipcase and fifteen special leather bindings with slipcase by Klaus-Ullrich S. Rotzscher. Each book contains eight original gelatin-silver contact prints by Dennis Letbetter. One of the images is a stereo photograph (viewer provided).